thinking about buying a 2000 cbr f4... thoughts? What's up guys? So I think I am going to buy my friends 2000 cbr f4. It is about 2 hours away so I will only be able to see it a few times if that before I buy it. What all should I be looking for when looking at this bike? It has about 19k miles. He wants $2500 for it. What do you think? sounds like a good deal. not much to go wrong with them. if there is a rattle its likely the cam chain tensioner, they a common week spot. $60 for a new 1, and about that again to have it replaced. that sounds like a pretty good deal. that was my first bike, i bought it with about 19K on it like the one your looking at and i traded it in for my new bike with almost 55K on it and i had to replace the fuel pump at 30K, $90, only problem i ever had with it and i aint gunna lie, i was a young hot shot and i beat the **** out of that bike and it kept right on goin lol but like stated above cam chain tensioner seems to be a common problem i got lucky and never had an issue, and since it is carbuerated just have to know that they can get gunked up may have to take em apart and clean em, cabeurated bikes tend to require a little more maintenace but its not bad, gives ya some good learning on how to take stuff off and fix it and that bike is pretty easy to work on. But seeing as i got $2000 for mine with 55K on it, thats a pretty decent price your friend is asking, especially if it hasnt been downed and isnt all scraped up. 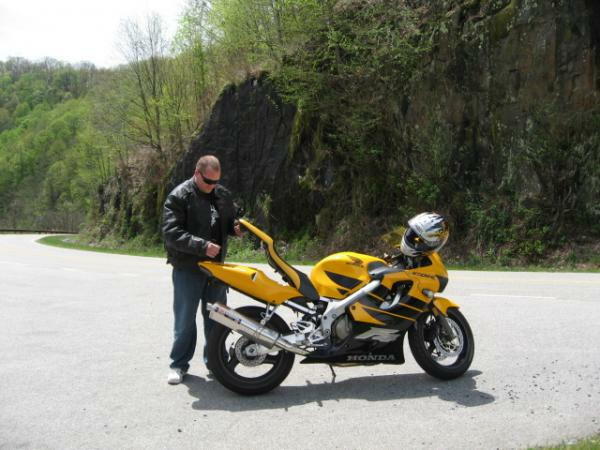 Me at the Dragon with my 2000 F4. Last edited by stretch_the_apex; 08-15-2011 at 07:09 AM. just a heads up. run some Stabil fuel stabilizer through the carbs before winter storage. and run some carb cleaner through them, once a year , just to keep those carbs happy. I am driving up tomorrow to take a look at it. The only problem is that is is scuffed up a little and the read tire is down to the metal wire (you know what that means). I will get some pictures and post them up some time tomorrow. Does anybody ride this bike in the winter? I ride mine year-round. Cooler months may require a little more choke in the morning but still fires right up. well I went to go check it out. It is in pretty rough condition. He let me drive it around a little bit though. I mean the motor feels strong, but I feel like after I drove it around it had a very small engine noise that I couldn't put my finger on. Are these engines noisy at all? Is it normal to have a little engine noise on a almost 20k mile bike? I also looked at a 2002 Honda CBR F4i, which was in PERFECT condition. He wants $3700 for it... but it is flawless, never dropped, stock, looks like it could be on hte showroom floor. Should I consider this bike? The F4i is a great bike and personally I would take that over the F4 because it is fuel injected which means no choke, no carb cleaning, no carb syncing and I like the looks of the F4i a lot better than that F4. I think that $3700 is a little high being the bike is about to be 10 years old but it is hard to find super clean 10 year old bikes. I think if you could it it for $3400 or there about that would be a good deal for both you and the seller. That noise could be a worn CCT or valve-ticking. Both could be easily repaired. But if overall condition is "rough", $2500 would be a difficult sell. The '02 looks very nice! Agreed, finding 10 yr old bikes in pristine condition is extremely difficult. It even has the danger stickers on it. R Dub makes some good points on F4 vs F4i. While I have an F4, know it inside & out, & not afraid of it being carb'd, given your specific choices, I too would try for the F4i. Offer low & settle for a fair price. I just purchased my 2002 F4i with 12K and like the one above (but in yellow) never dropped and almost showroom condition with the F&R brakes just done for $3400. CCT rattle for which I already have the parts on order. Very happy. Quick Reply: thinking about buying a 2000 cbr f4... thoughts?